This week's blog post is a bit different. There are hardly any blogging competitions for child or young adult bloggers, so when the MAD awards added a category, I was quite excited. Then I read the rules, which say bloggers are judged on one post only, and it has to begin with the words "My FAVOURITE way to spend a sunny day outside is...". So here is my entry. My FAVOURITE way to spend a sunny day outside is to sit down and imagine a world in which all bloggers are taken seriously, regardlessly of their age, a world where child bloggers are not given simplistic tasks in a single blog post to complete in order to win a prize. Right, so, my FAVOURITE way to spend a sunny day outside is…....... well If you have have been following my blog for the last five years, then you will know I spend my days exploring woods, finding animal skeletons, finding out the history of farmhouses that are centuries old, setting up camera traps for pine martens, exploring deserted castles, having massive military planes fly right overhead, finding our what rare birds live on the moors, and sometimes just sitting in a wood at dawn and seeing what turns up. But you know all that because I've written over 300 blog posts telling you what I have been doing, not just one single post because a competition told me to. Blogging is about judging any single post. It's about a whole journey, a whole story. You just can't judge a blog on one post alone. Blogging is also about writing about what interests you, what fascinates you, what you care about and what you want to find out more about. What I blog about is pretty much how I spend my time outside. I choose what to do, and what write about what interests me. When you start telling bloggers what their approved blog posts should be about, and what words they should be using, then you don't understand what blogging is about. I've been a bone collector for six years. No-one told me to start doing it. I do it because I enjoy it. After a year I started blogging about it, and I've written at least one post every week since then. I blog because I enjoy it. I blog about things I enjoy. No-one tells me what to blog about. I just do it. And the things I enjoy aren't the things that adults approve of either. I explore dangerous places, like old watermills which I needed a rope to stop myself falling off a cliff, or old world war II bunkers, or isolated mountains, or picking up roadkill, or studying how animals decompose, or navigating down mountainsides along streams, or the mating habits of red deer, or picking up poo, or regurgitated stomach contents, or even finding old unexploded bombs. None of these things exist on a nice cosy list of "things that adults approve of children doing". And I don't just do it on "sunny days" either. I'm outside in wind, rain, hail, and snow. And if children only blogged about subjects that adults thought up, starting each post with words that adults had approved, then the blogging world would be a duller place, with no amazing blogs about crap school dinners, or the UK's third biggest political party politics, or world football or birdwatching. 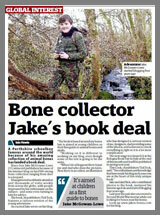 And even though bone collecting wouldn't be on the 'approved list', it still seems to have worked out okay for me. 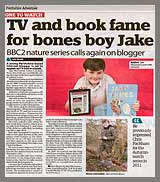 In the five years I've been blogging I've been in the newspapers, on TV, back in the newspapers, back on TV again, and my blog has been turned into a book. So I must be doing something right. So when I'm told that to prove I'm a good blogger in a blogging competition I have to write a nice, approved post about a nice approved topic, then it makes me think the judges don't really understand blogging and they certainly don't understand me. 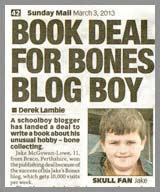 There are loads of brilliant child bloggers out there, writing what they want, when they want, how they want. They are not waiting to be told how to begin a blog post. They don't want to write a nice, approved post to get a pat on the head from a competition judge. So next year, remember: child bloggers aren't a whole different species. We don't need different rules. Judge us in the same way as you judge adult bloggers. It's too late to change the rules for this years competition, but I wanted you to know you're doing this wrong. Change them for next year. And I've written this as a competition entry not because I think I'm going to win, but because at least then you have to read it, and hopefully understand my point. What a super entry, Jake, thanks for entering. The reason we run the award this way is because we can't ask our poor judges to read 10,000 blog posts from 100 different bloggers and make a fair decision about which ONE blog is best. With adults' awards, that is why we use a voting system - so we let the people who read all those blog posts tell us which they like best. Thousands of people read those blogs, and so we think it's quite fair to ask them all to tell us about the blogs they love. All of our team are Mums and Dads and we talked a lot about it before deciding we didn't think it was fair to base a kids' blog award on voting - but we also didn't like the idea of asking our judges, who volunteer their time for free, to have to spend weeks reading all the posts on all the blogs by all the kids who enter. So we decided instead to ask the bloggers to write a post on a topic that we thought could be interpreted in LOADS of different ways. So no matter what sort of blog you write, or how old you might be, you can write about your favourite way to spend a sunny day. Our judges can then read one post from each blogger (so they still have time to eat, and work, and sleep!) and pick finalists from there. We do also look at the overall blog, and your age, of course. The great thing about the Internet is you can always tell people when you don't like something, and you certainly have! We take every bit of feedback on board, and do appreciate your thoughts. Best of luck in your continuing blogging journey. 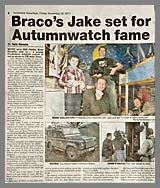 Jake, this is fantastic stuff and very inspiring for young people and adults too. Good on you. So true Jake. Damn right! people should take children more seriously. I appreciate that the judges may be suffering from a lack of time (and who isn’t these days) but their rules, even with the best intentions, have turned the MAD blog awards into a story competition, nothing more. 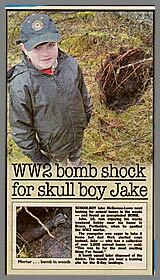 Jake, as ever, I applaud you. I'm sorry, but I'm going to have to agree with Jake on this one. Your defense doesn't really hold up. If, as you say, you are judging about 100 different bloggers, you would not have to read anywhere near the 10,000 blog posts you say you would. There are lots of other ways you could have configured the contest. For instance, you could have asked contestants to choose three or four of their most representative posts, and submit them. The judges could pick a few finalists from those, and do a more in-depth reading of the blogs of the finalists. Then they would really have an idea of the quality of the blog, rather than the quality of a single writing sample, which is not a blog... It's an essay. Anyway my suggestion is just one of literally dozens of configurations that would have been preferable to the way you have your contest set up. That's just my two cents. By the way, cool blog, Jake. That's so true. You speak directly from my heart. I wish there were more people like you , interested in nature on a deeper level ....or maybe I should say ..a higher level . Yes, yes, and furthermore, YES. Good post. It seems to be very popular ! I think you're a remarkable young man. I am an animal lover, nature lover and I home school my kids. We haven't gone looking for bones but when we find them is like to save them (I found your site seeking intstructions on cleaning bones) and use them as an opportunity to research what they are. I absolutely agree that they tell you about how an animal lived and people interested in nature and animals should naturally have a curiosity about bones. You're are such an inspiration and wealth of knowledge- thank you for the excellent website. I've only just found you here on the internets but you're already someone I look up to - even though you're a lot shorter than I am. I'm looking forward to keeping myself updated on your blog. 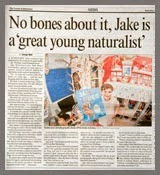 'No, because bones aren't really about death.' This, right here. I have lost count of how many times I've had to explain this to someone. I'll definitely remember some of these when people ask me (again) why I'm studying archaeology. I hope your friend's tormentors get a new hobby and leave her alone, because she's awesome just by virtue of doing what she enjoys. And this is exactly what the world is missing out on by not taking kids seriously. Awesome job, Jake. 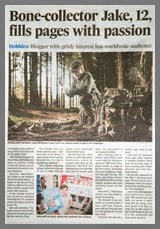 Great article - check my own site - www.mahalski.org - I think we even used some of the same words. 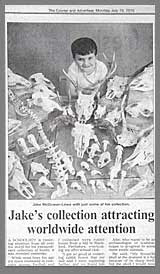 I'm a bone collector as well, but it wasn't until I discovered your blog that there are others like me. I love your post. Happy hunting! Thank you for that. I totally know what you're talking about... All my friends think this hobby is weird and creepy (so honestly I've kind of heen hiding it, which likely makes them find it creepier XD). But yeah you have a point, or rather several points. So why do deer even have antlers ?